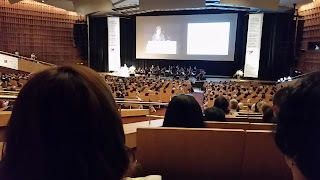 Throughout the Thirteenth International Congress on Mathematical Education (ICME-13), I had the opportunity to listen and reflect on a number of competing geometry education paradigms. Despite the wide range of philosophies, curricula, and pedagogical strategies, I found that almost all perspectives can be placed on a continuum between a traditional “axiomatic-style” and a more reformed “discovery-style”, with some room for outliers. During a survey of current geometry curricula, Nathalie Sinclair (Canada) noted that, “Proof, and more generally geometry curricula, are bound to socio-cultural norms.” Interestingly, the style of geometry that each country favored tended to be a reflection of their culture. In this overview, I will explore where various countries fall on the continuum, and how their views are ultimately intertwined with their culture. 2. Western Europe: Other European countries also employ a more axiomatic style, but for different reasons. Halfway through the conference, I had a conversation with Bernie O’Donoguhe (Ireland) about the role of Geometry in Ireland. She reported that secondary education in Ireland is largely motivated by two exams: the Junior Certificate and the Leaving Certificate. Both exams have mandatory sections in mathematics with an emphasis on axiomatic geometry. While many other western European countries have changed or done away with the geometry content in their end of course exams, Ireland’s history of moderate isolationism from mainland Europe may help explain why they have not followed this trend. It has only been very recently that the Irish government has discussed deemphasizing the role of axiomatic geometry on the Junior Certificate. Most Western European countries (e.g. France, Spain, Italy) have recently reformed their curricula to either move away from the axiomatic method or decrease the role of geometry altogether. In a panel on the teaching and learning of geometry, Maria Bartolini (Italy) explained that the concept of proof in Italy is no longer tied exclusively to axioms. Rather, students often believe that accurate measurement and repeated trials can lead to a rigorous proof, and not just a mere conjecture. Nathalie Sinclair quickly added that Dynamic Geometry Environments (DGEs) such as Geogebra can be used to bridge the gap between empirical conjectures and more theoretical approaches to proof. By using check boxes, sliders, and drag features, students can both collect data to make conjectures, and get a visual-spatial understanding of how a particular theorem works. Bartolini agreed and noted that many Western European Countries have decreased the breath of geometry content on their exams, allowing for more classroom time to explore geometric theorems using DGEs. 3. Northern Europe: During the thematic afternoon, I learned that while many of the reforms in Western and Central Europe are new, the Netherlands has used Realistic Math Education (RME) for some time. Although the didactics of RME are not uniform across the country, the basic tenets of RME are the same. According to Marja Van den Heuvel-Panhuizen (Netherlands), RME should both start with and end with a context that is imaginable and real to the student. Problems must be novel, but can include an intra-mathematical or extra-mathematical context. In a similar session, Guenter Krauthausen (Germany) explained that RME lessons in the Netherlands are often task-based with room for multiple approaches and natural differentiation. In natural differentiation, the teacher presents all students are presented with the same complex task. Then, students informally self-select the solution method, manipulatives, notation, and group members that they will interact with. This provides a very open and social learning environment, where geometric axioms are only taught if apply to the task, and only if the student requires it. As a result, students in the Netherlands are exposed to less content, but more depth. 4. East Asia: While there are stark cultural and pedagogical differences between the Scandinavian countries and the East Asian countries, their current approach to geometry is remarkably similar. Both regions teach through tasks and only discuss content that is relevant to the current task. Interestingly, most of the tasks in Japan’s national geometry curriculum contain some aspect of geometry. The Japan Society of Mathematical Education (JSME) led a session that featured six tasks from their curriculum. Although each task had multiple facets, every task required a non-trivial level of geometry content to complete. For example, one task involved folding a paper pentagon to make new shapes. Another task asked students to chop a cylindrical log into rectangular prisms of lumber. Unfortunately, I was not able to determine the prevalence of geometry in The Netherlands curricula, and thus I can only assume that Japan may emphasize it slightly more. Another point of similarity between the Netherlands and Japan is the amount of mathematics content each country reportedly focuses on. According to Jinfa Cai, both countries cover less than 70% of the content on the Programme for International Student Assessment (PISA) and Trends in International Mathematics and Science Study (TIMSS), and yet they have some of the highest scores on these tests. In fact, Japan claims to explicitly cover less than 60% of the content on the most recent TIMMS. Towards the end of the conference, the JSME facetiously demonstrated how small and skinny their textbooks were compared to their larger and bulkier American counterparts. The display was a bit tongue-and-cheek, but the point is well taken. In Japan, less explicit curriculum can translate to higher test scores. How can two very different cultures produce such a similar geometry curricula? Why do these countries perform so well on international assessments? Can this success be replicated in other cultures, such as ours? I suppose the answer to these lie in additional research about these countries, their curricula, and their cultures. In an effort to reach out to other teachers, I plan on disseminating the information I have gathered here through regional conferences and publications in New England. Hopefully, this will bring myself, and the math education community as a whole, one step closer to answering these questions.